Along with all of the other stresses that come with entering adulthood, figuring out where to get your career started after college can be a pretty daunting task. It may be tempting to stay in the city where you went to school, or to flock to a major hub where you think there may a glut of job opportunities. But if you consider all the elements that actually make a place most optimal for fledgling members of the workforce, your best options may be a bit surprising. 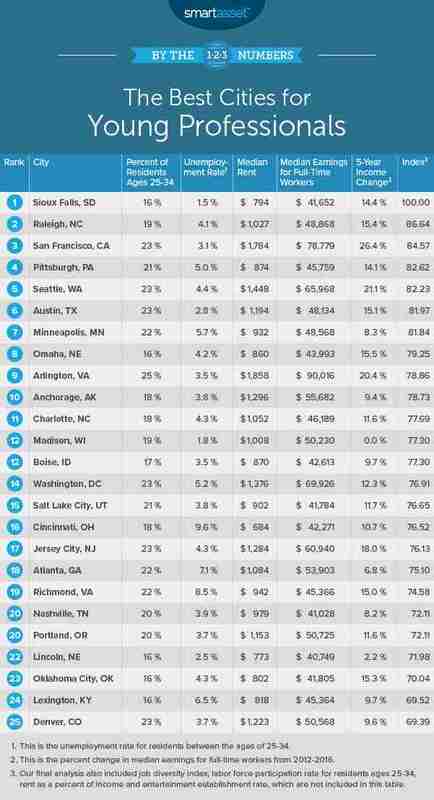 Fortunately, some pros have done all that hard work for you by crunching the numbers to determine the best cities for young professionals. The latest findings, which were revealed by the data team at personal finance site SmartAsset, were determined by weighing a number of factors that together make a city particularly suited to help a young professional kickstart their career and future financial success in 2018. Specifically, they looked at nine different metrics including the percentage of residents between 25 and 34 years-old, the unemployment rate for young adults, median rent, median earnings, job diversity, the number of fun and entertaining things to do, and the five-year change in median earnings. In other words, they made sure to locate places where people won't be stuck in a dead-end job, will be able to steadily increase their income, can afford to live well, and have fun. 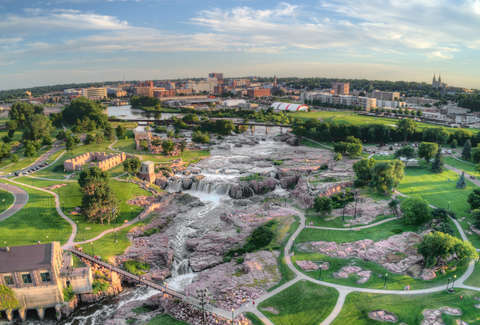 This year, Sioux Falls, South Dakota took the top spot for the second year in a row, with Raleigh, North Carolina coming in at No. 2, and San Francisco, California rounding out the top three. Here's how the full ranking of the top 25 cities came out. As you'll notice, the best cities for young folks looking for a high quality of life while kicking off their career are scattered quite a bit geographically, so you can likely find a solid spot to settle no matter what part of the country you'd prefer to be in. There's also quite a bit of diversity when it comes to city size, so there are options for people looking for small, mid-level, and large locales. Even better, quite a few of the cities on the list also happen to be among those where you can actually afford to buy a house these days.